It is commonly understood/accepted that commercial property managers and condominium board members are responsible for all major decisions relating to the maintenance of their buildings and grounds, as well as efficiently managing all associated finances and budgets. This can be a sufficiently challenging task under the most ideal circumstances as it is simply hard to please all of the people all of the time. Regrettably, what is considered ideal is often disrupted by the unexpected; in other words, reality has a way of rearing its head on a regular basis. As a decision maker, you can find viable solutions in the stucco work/applications offered by Canadian Stucco. Enhancements and upgrades via stucco walls and various features can be effective options for addressing the maintenance/repair needs of the building and/or the desires of its occupants/tenants while also keeping an eye on budgetary considerations. Despite regular and adequate maintenance practices, there will come a point in time when multi-unit structures/complexes start succumbing to age. Furthermore, these buildings can also be subjected to damage at any time, whether caused by natural forces or man-made. All such problems must be rectified, preferably sooner rather than later, in order to prevent more widespread damage and more extensive/expensive repair or replacement work in the future. An EIFS (Exterior Insulation and Finish System) stucco application installed by one of the certified crews from Canadian Stucco, may be the best solution for the immediate issue at hand and also from a long-term perspective. 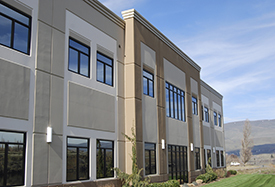 Converting the exterior building walls to EIFS stucco applications provides several benefits for commercial property managers/condo boards and the leaseholders and/or residents of such complexes. If you have a vested interest in maintaining and/or upgrading your commercial structure or multi-unit residence and are accountable for managing the budget for the property, call the certified stucco installation specialists from Canadian Stucco today at 416-5-STUCCO or 416-578-8226 to arrange a no-obligation consultation on the potential options available to you and your tenants.